Jennifer Higdon has relatively quickly become one of the leading contemporary American composers. Her style is tonal and relatively harmonically conservative, but sounds contemporary nonetheless and quite strikingly American. On the evidence of the works here she is particularly adept at creating energetic and momentous fast movements; the slow movements are poetic and full of color but has a slight tendency to meander. Perhaps the music is most appropriately summed up as creating new sounds, melodies and effects by relatively conventional means. Her teachers included Robert Spano, who conducts the music here, and Ned Rorem, whose musical poetry seems to have made something of an impact. The Concerto for Orchestra (2002) is at least full of exuberant rhythms and brilliantly developed textural evolutions. 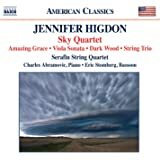 The work is cast in five movements (like Bartók's, which seems to have been a source of inspiration, but which nevertheless is quite removed from Higdon's somewhat slicker work), and characterized by forward momentum, brilliant scoring (especially the percussion), and some beautiful moments of calm. That description sums up the first movement pretty well, at least. The second movement, for strings, is perhaps the most obviously melodic movement; it works itself from a pizzicato opening to gradually solidifying textures when section after section start using bows. The third movement is a substantial and very colorful slow movement with plenty of (excellently performed) solo material. The fourth movement, for percussion, is imaginative and inventive, and builds up to some exciting climaxes. The final movement is a highly energetic, quick-paced, and very enjoyable (and surely a real challenge to the players, who tackle it with aplomb). Overall, this is a fascinating and rewarding work. City Scape consists of three movements constructed to be performable separately as well as together as a single whole. The movements are impressions or reflections of Atlanta (where Higdon grew up), opening with "Skyline", a bold, exuberant, rhythmically muscular and lively movement, though without really any memorable material. The "River sings a song to the trees" is by far the longest movement on the disc, and while there are some evocative details this is unfortunately a pretty meandering and aimless piece of the kind you have heard innumerable times before from modern tonal composers. The finale, "Peachtree Street" is buoyant and brilliantly scored, and pretty enjoyable even though it tends to go for cheap thrills. Overall, this is a decent but hardly exceptional work. The performances are absolutely superb. 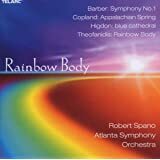 The Atlanta Symphony Orchestra plays with spirit and panache, and there is immaculate attention to detail and wonderfully realized textures to boot - I doubt this music could have found better advocacy than this. The sound is excellent as well, and the notes are interesting. 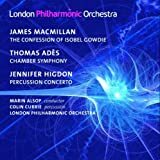 Overall, then, this is an impressive release; the Concerto for orchestra is definitely worth hearing and deserves to be picked up by other orchestras as well; City Scape is more of a run-of-the-mill piece that does contain some interesting parts. Nevertheless, a recommendable disc. I heard City Scape on the radio and was impressed enough by what I heard to order the CD. For me the music is hard to categorize as "who it sounds like." I think that Jennifer Higdon has her own voice and this is reflected in the works recorded here, a Grammy nominee. The Concerto for Orchestra, written for the Philadelphia Orchestra, is structured after Bela Bartok's work of the same name. This Concerto begins with chimes and timpani and goes on to give the strings quite a workout with spiraling scales before moving onto the woodwinds and brass sections. The second movement is for strings alone and is a Scherzo in tempo. It starts with a pizzicato theme and gradually all of the players move to the bow beginning with the concertmaster. The middle movement turns to the entire orchestra with each principle player having a solo before the entire orchestra, moving from woodwinds to strings to brass and percussion. The fourth movement belongs to the percussion and is perhaps the most inventive music pitting the various drums and timpani in a battle against each other. The use of a harp, piano and celesta added a mysterious quality to their part of the movement but this music, for me, explored this section of the orchestra as completely as no other has. The final movement is for the full orchestra. It begins with strings alone but soon the orchestra is playing over the perfusion, carrying on their "battle" from the prior movement. The same orchestration is reflected in City Scape. The first movement, representing downtown Atlanta, is heavy with percussion. It depicts the changing skyline of the city as it grows and become bolder. The middle movement, depicting nature is pastoral. 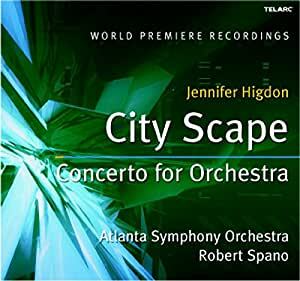 It is a journey through the parks and green landscapes of Atlanta: a quite movement that slowly builds to the entire orchestra and resumes a quiet, meandering exploration. The find section recalls Peachtree Street, a main road in the city. The music recalls the busy nature of the street and the motion of those walking and those driving along. The music depicts the changing nature of the street with a quick, rhythmic theme played by the orchestra. The bustling nature of the music slows and becomes quieter for a brief section before returning to the busy, bustling theme. I felt engaged by Ms. Higdon's music: it is not abstract, atonal music (like Luciano Berio, for example) but tonal and filled with interesting ideas. The Concerto for Orchestra allowed her to juxtapose the sections of the orchestra and present some interesting effects. City Scapes presents an interesting picture of a growing metropolis. Anyone curious about current day composers should find this CD of interest. 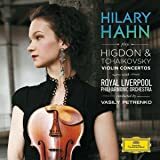 Higdon is a master orchestrator and this CD is sparkling example of her genious. For those here entering 1 & 2 stars...send me your manuscripts and awards...I just want to be sure you can do better. Higdon has captured the city of Atlanta in todays terms...and done it beautifully. GET THIS CD as the soundstage is very wide, detailed and an exciting experience for the ear...all brought to us by the geniuses at TELARC. ITS A WINNER. Never heard of this composer until I heard the composition on radio. The Concerto uses a full range of sounds and I especially enjoy the use of a wide range of percussion instruments. Good melodies and orchestration. Listening to this concerto is like a breath of fresh air on a spring day. AWESOME C.D. I am enjoying the music!!!! I listen to it alot. I recommend it to anyone for good music!!! !